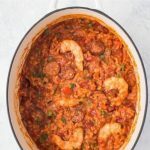 You can make this authentic homemade Creole Jambalaya Recipe really easily! It’s flavor packed with bell peppers, celery, onions, spices, Andouille sausage and shrimp, you’ll love it! It’s also gluten free and dairy free. 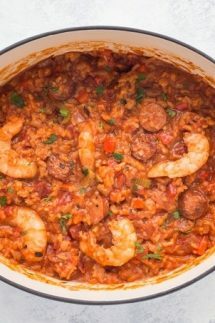 What is an authentic Jambalaya Recipe? 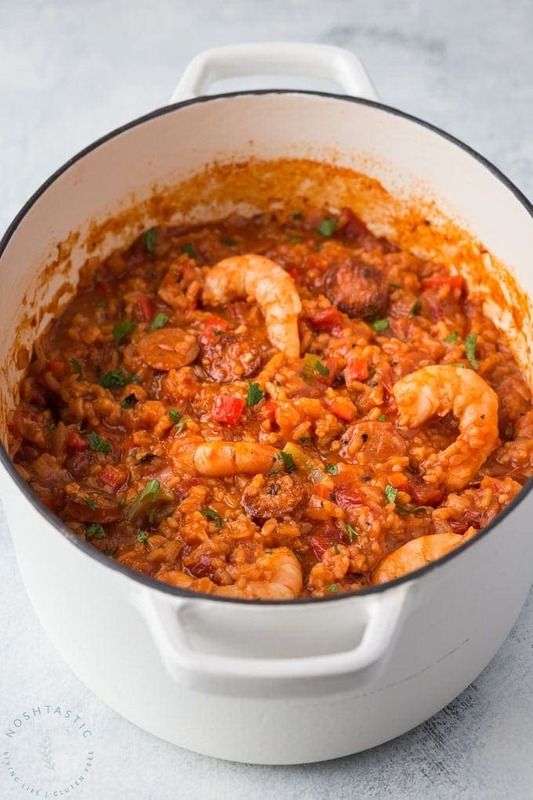 Jambalaya is one of Louisiana’s most famous dishes that has both French and Spanish influence, it’s quite similar in style to Spanish Paella in that is has rice and often seafood. Cajun style Jambalaya tends to be more brown in color as the meat is cooked first in the pot, then the vegetables are sauteed after that and cooked in the rice with stock. Creole style, also know as ‘red Jambalaya‘ includes tomatoes which are cooked along with the trinity of vegetables, onions, bell peppers, and celery, and then cooked with the rice and stock as before. Both versions are delicious and tasty, but for my recipe I’m tending towards a more Creole version as I’ve included some fire roasted tomatoes. Whats the difference between Cajun and Creole cooking? Well, as mentioned above, the main difference seems to be that Creole cooking uses tomatoes and authentic Cajun recipes do not. There’s more to it than that I’m sure, but you get the idea! Jambalaya is a very forgiving recipe, so even if you overcook it a bit as I have on occasion, it will still be delicious. The first thing you want to do is cook the andouille sausage pieces in a large heavy bottomed pot until it browns a little and then remove them with a slotted spoon. Then you add the classic creole vegetable ‘trinity’ which always includes bell pepper, onions and celery and soften them a little along with a creole or cajun seasoning blend. The next step is to add the rice, I like to rinse it first, then return the sausage to the pot, add the chicken stock, fire roasted tomatoes and then bake it in the oven for about 40-45 minutes. I add the shrimp in right at the end, it will cook in 1-2 minutes in the heat from the rice. A wonderful Creole side dish to serve alongside this would be my Corn Maque Choux, it’s another Louisiana classic and only takes minutes to prepare! What Spices are used in Jambalaya? You can buy ready made cajun or creole spice blends, but I prefer to make my own if I can. My version has garlic powder, onion powder and oregano, along with paprika, thyme and salt and pepper. If you want a little heat then you can add cayenne pepper, but the people in my house won’t tolerate much spicy heat so I left that out. 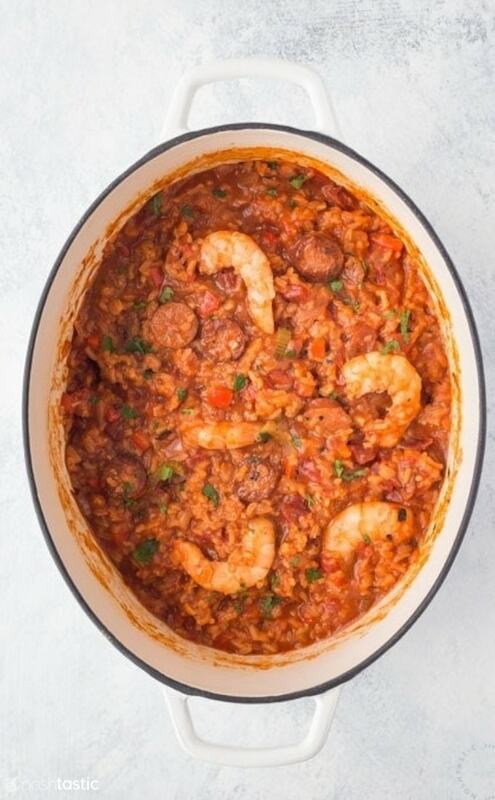 Easy Jambalaya Recipe you can bake in the oven or cook on the stove. Using a little olive oil, cook the Andouille Sausage slices in a Dutch Oven until they are a little caramelized on both sides, then remove with a slotted spoon. Add crushed garlic, onion, bell pepper, and celery to the pan and saute until soft, about 3-4 minutes on a medium heat. Add the seasonings to the pan and stir well, then add the rinsed Jasmine rice and add that to the pan along with the chicken broth, fire roasted tomatoes and return the andouille sausages to the pan, mix well to combine. Once the rice is cooked stir in the raw shrimp, then put the lid back on for 3-5 minutes. The heat from the rice should be enough to cook the shrimp all the way through. Cover and bake at 350F for 45-55 minutes or until rice is fully cooked. Serve with sliced green onions and hot sauce on the side. If you're looking for a side dish to make with it my Corn Maque Choux recipe would pair really well. Thanks Shannon, glad you liked it! The rice did not cook at all. I’m really disappointed in how this turned out. Did you use specific quick cooking rice? Hi Chelsea, what kind of rice did you use and how long did you cook it for? 15-20 minutes is typically more than enough time to cook Jasmine rice. I loved the seasoning recipe! I didn’t have the fire roasted tomatoes on hand, but I had some plain ones that still tasted great. I also added some kidney beans even though those are not traditionally in jambalaya, we just love beans! I also had to cook mine a bit long because I used brown jasmine rice but it all turned out delicious! Thanks for sharing! I agree that my jasmine rice took much longer than 20 minutes, more like 55 minutes. And I had to add half a cup of chicken stock every 10 minutes kind of like risotto. But the recipe was still delicious ! I’m not sure why your rice took to long to cook as it’s normally done in about 20 minutes as long as the lid stays on. Were you using white rice? Can this be made in a slow cooker? Or could you cook it ahead and kept warm in a slow cooker? Hi Evelyn! I think you could make it in a slow cooker, though I’ve not tried it that way yet. I might try cooking it on high in your slow cooker for three to four hours, minus the shrimp and the rice. Add the rice for the last 20-30 minutes or until cooked, and add the shrimp in the last 5-10 mins. I thought it had good flavor. But I followed the recipe exactly and my rice was not cooked either. It took much longer and never got fluffy. Not sure why? Really nice flavour and it’s always great to have a tasty filling meal that works for my son (dairy free) and me (gluten free) in one pot! It was 25 mins in the oven for me and the rice was great. Maybe it depends a lot on your dutch oven or how much liquid is in your tomato cans? I used regular diced tomatoes since I didn’t have the fire roasted and they were pretty watery. This was our first recipe from your blog…can’t wait to try more! I’m so glad you liked it Chelsea! When do you put the shrimp in? Hi Beck, good catch, I edited the recipe recently and the directions for the shrimp seemed to have disappeared! Regardless of whether you cook it in the oven or on the stove you add the shrimp in right at the end stirred into the cooked rice and put the lid on for them to cook for about 5 more minutes. Can you freeze this recipe ..without the rice and shrimp?I wanted to use for event next week and I made the sausage and chicken in it already. Hi, I’m honestly not sure if you could freeze it like that but I don’t see why not.